We’d love your help. Let us know what’s wrong with this preview of Star Wars by Gerry Duggan. Known as the skilled co-pilot of the infamous Millennium Falcon, the legendary Wookiee warrior CHEWBACCA will star in his very own adventure! After the battle of Yavin, Chewbacca is on his own when he crash lands his ship on an Imperial occupied planet. Now stranded, Chewie finds himself caught in the middle of trying to return to the rebellion and helping a young and feis Known as the skilled co-pilot of the infamous Millennium Falcon, the legendary Wookiee warrior CHEWBACCA will star in his very own adventure! After the battle of Yavin, Chewbacca is on his own when he crash lands his ship on an Imperial occupied planet. Now stranded, Chewie finds himself caught in the middle of trying to return to the rebellion and helping a young and feisty girl in need. Aaaaaarg Hraaa Grughh Hunnhh Hurraaaaa Hrr Hrhghahhhaaaah! Wait, why do you look so confused? No hablo Wookieespeak? Well, let me tell you a secret. Neither can I! So, when the title character speaks a language that you can't understand, what the hell do you do? The solution, my friend, is to add another character that talks way too much to compensate! In this case, it's a kid named Zarro. Zarro and her dad are slaves in a deadly mine run by generic crooks. And for obvious reasons, the girl escapes and finds our Wookie. Guess what happens next! A short and sloppy adventure with a lot of Wookie action and explosions. About the only thing I was curious about with this Chewbacca limited Wyaaaaaa, it’s a Chewbacca (minus Han) solo comic! I really enjoyed this one. It was a simple tale, but an action-packed one with a moving ending. The artwork was really nice too. I'd definitely be up for more of Chewbacca's solo adventures in the future if this team wanted to do a sequel. More of a Young Adult story. Another solo (pun not intended) mini-series from SW universe that takes place right after Battle of Yavin. Chewbacca is on a personal mission and crashlands on some planet where he meets a local girl. Her people were enslaved by some ugly piece of turd and she asks Chewie for help. And this is how a fast-paced action adventure with growling hairy dude starts. Story-wise it's nothing special and you can probably skip it but the art is really nice. A lot of fun - a surprise seeing Chewbacca without Han Solo and the Millennium Falcon, but that finds a way to make it more fun. It appears that Marvel is making an effort to write comic book miniseries for just about every major Star Wars character, except for Darth Vader (which will finish his larger comic series after the 4th volume concludes) and Luke Skywalker (who got his own novel and is the main character in Jason Aaron's ongoing Star Wars comic). Gerry Duggan's Chewbacca is the most recent completed comic in that trend that has added now ongoing comics starring Poe Dameron and Han Solo. I was pretty curious as to It appears that Marvel is making an effort to write comic book miniseries for just about every major Star Wars character, except for Darth Vader (which will finish his larger comic series after the 4th volume concludes) and Luke Skywalker (who got his own novel and is the main character in Jason Aaron's ongoing Star Wars comic). Gerry Duggan's Chewbacca is the most recent completed comic in that trend that has added now ongoing comics starring Poe Dameron and Han Solo. I was pretty curious as to how it was going to be going in. Would it be fantastic like Charles Soule's Lando? Or would it be closer to the sheer awfulness that is Mark Waid's Princess Leia? The answer? It's pretty in between. Don't let the rating immediately tip you off, though, I did enjoy reading this one. I'm going to change the structure of my review, though, because with the Chewbacca comic i think it will be easier to just talk about each aspect individually than by lumping stuff into "THE GOOD" and "THE BAD". The thing about this comic is that there aren't really any major flaws, but nothing really stands out as spectacular either. To be clear though, I didn't think it was bland. Before I talk about each aspect of the comic, let's have a quick synopsis. THE STORY: Following the Battle of Yavin, Chewbacca has embarked on a personal mission. Unfortunately, he crashlands on an Outer Rim Planet called Andelm IV. On this planet we have a young girl named Zarro who's father is deep into debt. The lender forces them into slavery under a gangster named Jaum in order to pay him off. Zarro escapes, and she stumbles upon Chewbacca, who is in town trying to buy the parts he needs to repair his ship. While struggling with a language barrier, Zarro convinces Chewbacca to help her free her father and the rest of the slaves working under Jaum. The art is perfectly serviceable. It's nothing special, but it wasn't ugly or unintelligible. I could understand what was going on, the characters looked fine, and Chewbacca himself was drawn good enough for me to be able to tell how he was feeling. 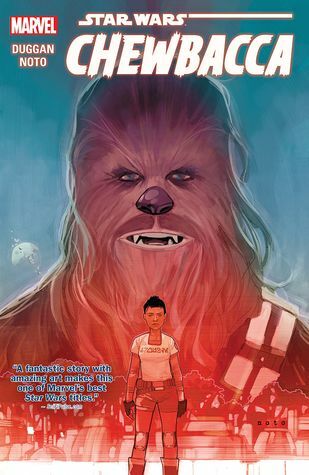 I think it would have been possible to get more emotion out of good old Chewie but I understand not every star wars comic is going to have universally fantastic artwork, and Phil Noto still did a pretty good job. The action is just fine as well- not dull, but not totally exhilarating either. The characters are decent- not that complex, but for the most part perfectly fun and likeable. Jaum is a mostly forgettable villain, but he has a couple cool moments. Zarro's dad has nothing new to his character, but I did think his relationship with his daughter was nice and sweet. You got your usual imperial officer of the week type character who will show up in order to give the Empire a presence, but I have to admit, I like the unique way he was used in the climax of this comic. Chewbacca doesn't really bring anything new to the table in terms of personality that he had in the films, but he is just as lovable and fun in this comic as he is in the films, and reading about his antics with Zarro was fun. Zarro was my favorite character in this collection, and probably one of the best parts of the comic. She's definitely the most interesting character here. She's resourceful and tough, yet still has the vulnerability and fear that a kid in her situation would have. The writing is pretty good, with some good dialogue between Zarro and Chewbacca. It's actually kind of adorable when Zarro is trying to figure out what Chewie is saying and never really communicating accurately with him. I also like what they do with the imperials in this comic. No spoilers, but it's not really something you see every day. Beautiful art. Fun star-wars setting. I love the main character (not the title character's) ability to run a bluff like WOAH. Chewy, you have a fantastic knack for finding the best disreputable people. Kinda ignored EU history and geography, which made me sulk. It didn't really do anything new, though? "Pwease, Mistew Chewbaccer, you just GOTTA save my daddy fwom da bad guys!" Sod off. Sigh....that was terrible. These new Star Wars graphic novels are not done well at all. Oh well. An interesting and fun backstory for a beloved film character. Nice to have a comic featuring Chewbacca. Glad they were able to free the miners. Hope Chewie will have fun with his family. Can't wait to read more Star Wars comics!!!!! A quick tale about Chewbacca taking a detour on his way to Kashyyyk after the events of A New Hope. He crash-lands on a planet on the verge of being surrendered to the Empire and has to help a plucky young girl save the day in the face of overwhelming odds. The artwork is solid here. It's not that glossy, mass-produced look that a lot of modern Star Wars comics are rocking, but it's still clean and professional. There are some really lovely panels throughout the comic, li A quick tale about Chewbacca taking a detour on his way to Kashyyyk after the events of A New Hope. He crash-lands on a planet on the verge of being surrendered to the Empire and has to help a plucky young girl save the day in the face of overwhelming odds. The artwork is solid here. It's not that glossy, mass-produced look that a lot of modern Star Wars comics are rocking, but it's still clean and professional. There are some really lovely panels throughout the comic, like the full-page rendition of Chewbacca laid out in a field of pink flowers. There's also a series of panels with Chewbacca's altercation with a stormtrooper being told through the movements of his shadows and the facial expressions of the young girl, which is particularly well done. The story is simple and plays out fairly predictably, but it's still a good time. There are some nods to the events of A New Hope (like what happened to Chewbacca's medal for helping blow up the Death Star), and some really fun action sequences (at one point Chewbacca dresses up like a droid; at another he punches a stormtrooper in the face, which was sickeningly satisfying). One thing that didn't quite gel for me was Chewbacca's overall mission. He was on his way to Kashyyyk to deliver a package (I won't spoil what's in it) and the final panel shows the Millenium Falcon coming to pick him up on his homeworld, but I've always been under the impression that Kashyyyk was more or less an Imperial bastion for manufacturing a steady supply of slave labor during this period. It seems strange that Chewbacca was able to just pop in to a village that seems unaffected by the Empire's presence, deliver his package, and then hop on the Millenium Falcon--which just helped blow up the Death Star! !--without any problems. It's a nice B-story, but it doesn't make sense in the context of the Star Wars galaxy. Star Wars: Chewbacca collects issues #1 - #5 of Chewbacca. I am impressed as to how easy it was to interpret Chewbacca's emotions and what it was that he was saying, considering all he says are variations of arrrrgggghhhhh. The story line follows Chewbacca who has crash-landed on an Imperial controlled planet an his struggles with the local as he try to acquire the parts that he needs to fix his ship. It is a fairly simple storyline that goes where you expect i Read this review and more on my blog. The story line follows Chewbacca who has crash-landed on an Imperial controlled planet an his struggles with the local as he try to acquire the parts that he needs to fix his ship. It is a fairly simple storyline that goes where you expect it to. The art style use a lot of pastels, which did not work for Chewbacca but showed off the new planet perfectly. In all honesty, not much about this art style was stunning and made me stop to look at any of the images. New canon Star Wars comics don't let me down and neither does Phil Noto's art. 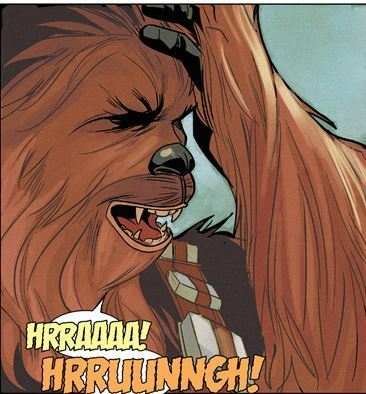 Comics are a surprisingly great medium for Wookiees, I thought the way they handled Chewbacca's dialogue was great. Chewie without Han?? How can this be?! I love Star Wars. I want to love everything Star Wars. This? I didn't love this. I did like it though. I knew it'd be a tricky one because aargh-arghoo. That said, I'd still read anything else Star Wars that comes along. So this was fun, I enjoyed it. kinda cheezy entertainment. It lost a star for having multiple not funny jokes about "letting the wookie win." enough already. There needs to be a Chewie mini-series set on his home world during the Clone Wars. The first cover Che-bacca revolutionary look. I know genius. This heartwarming Chewie story sits on well-known plot base - hero gets stuck somewhere, get to know local underdogs, get talked into helping, wins and leaves. This is so common it can't be a spoiler. There is zero invention but 100% of professionality for Star Wars lore and feeling. So if you're SW fan, go ahead. You can't go wrong with Chewie here. How can you create a comic series based on a character that can only growl? By putting a talkative child in as well. This was not the worst Star Wars comic series, but it's a close one. There were a couple of good moments, but in all honesty, not worth the money i spent on it in the sale. Shame, as Chewie is one of my favorite characters. Nearly all the Star Wars comics I have read are equal measures fun, pandering, interesting world building, needless information, confusing allusions to stuff I have no idea about, and hilarious one-liners. Again, this volume was all of the above. A good one to grab from the library, but not worth buying your own. This was cute! A nice, short story that still led places with a wonderful and yet sad/touching ending. Long live the Wookie. Not the best to have a story around a character that is impossible to understand. Satisfactory, but not moving. Chewie probably deserves better than this. Can anyone recomend me a book that gives this character an interesting backstory? Canon or non-cannon is fine. nuda, holka je děsně otravná.